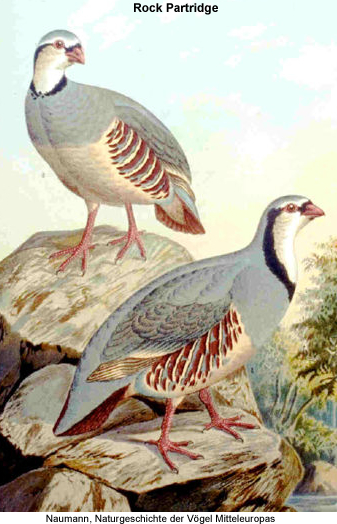 The Rock Partridge, Alectoris graeca, has its main (native) range in southwestern Asia and southeastern Europe, and is closely related and very similar to its eastern equivalent, the Chukar, A. chukar. This partridge is a resident breeder in dry, open and often hilly country. It nests in a scantily lined ground scrape laying 5-21 eggs. The Rock Partridge takes a wide variety of seeds and some insect food. It is very similar to the Chukar, but is greyer on the back and has a white, not yellowish foreneck. The sharply defined gorget distinguishes this species from Red-legged Partridge. The song is a noisy ga-ga-ga-ga-chakera- chakera- chakera.